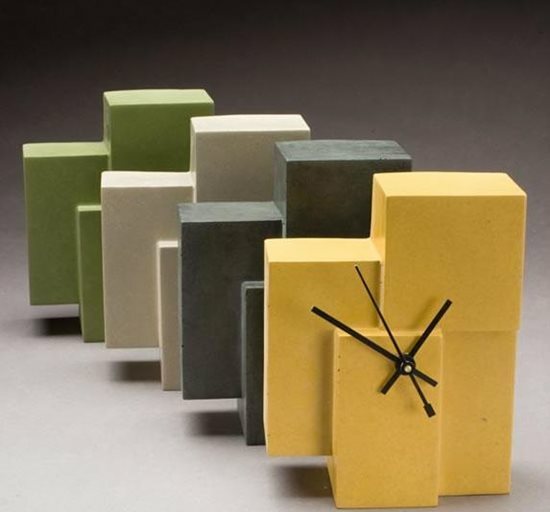 These concrete clocks aren't as heavy as you think. They are made using a dual mold system, which makes them hollow. What do you get when you combine 16 years of concrete countertop making experience with strong community connections, a collaborative atmosphere and an unparalleled creative vision? You get Concrete Revolution [Studio], a unique business that produces a product line consisting of concrete furniture, home accents and even jewelry. Owner, Allen Miller, says the studio has been an idea of his for more than 10 years. "We had all this bottled up creative energy," he says, referring to where the inspiration for the product line came from. While Miller and his crew were working on projects for his existing countertop business, Concrete Revolution, they'd get ideas for useful products and interesting designs. These ideas have finally come into fruition for Miller and his team with the recent launch of the Concrete Revolution [Studio] website, which features an online store. "One of the driving forces behind Concrete Revolution [Studio] is to create a more accessible product," explains Miller. "Before, we were only creating massive 1,000 to 2,000 pound pieces that were completely customized." Miller wanted people who couldn't afford such pieces to still be able to enjoy the beauty of concrete in their homes. The solution was to create smaller, more affordable items, such as concrete storage boxes, clocks, and wine cubbies. 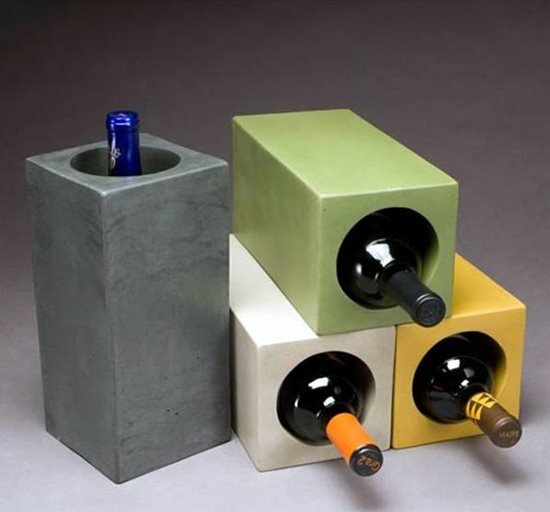 Concrete Revolution [Studio] makes wine cubbies that keep wine cool naturally. One would think that the transition from countertops to smaller decorative elements would be fairly easy. That wasn't the case for Miller, who completely redesigned his concrete mix and spent more than six months developing and testing molds. Even though the process took time, Miller says, "It was very liberating – we weren't confined to matching our previous colors and look, we could do something fresh." The result was a much greener mix design that uses a cement substitute and unique molds that can be reused again and again. Two of Concrete Revolution [Studio]'s most unique products are the wine cubbies and clocks. The wine cubbies, officially called Wine Rocks Squared, are precast concrete blocks, with a cylindrical hole all the way through the middle. Because of concrete's cool thermal character, the wine cubbies help keep wine cool naturally. The clocks have a modern geometric design and are light enough to hang on the wall, but also heavy enough to use as bookends. This perfect weight is achieved by using a dual outer/inner mold system, making it so the clocks are actually hollow. The clocks are cast with a small hole on the front where the movements, or hands, are attached after curing. The wine cubbies and the clocks come in four standard colors: charcoal, pear, glacier and maize. 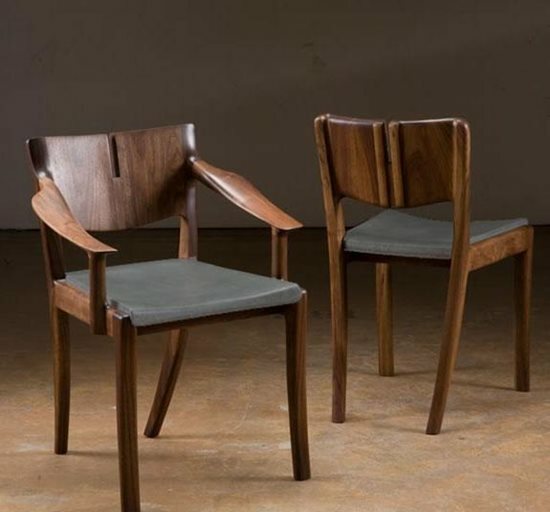 Wood and concrete chairs made by Concrete Revolution [Studio] Featured Artist Ethan Hutchinson. Miller is especially excited about the collaborative possibilities of Concrete Revolution [Studio]. "On jobsites I've met so many talented crafts people that are intrigued by the creative possibilities of concrete," he says, "The Featured Artists aspect of the business strives to support these local artisans by allowing them to express their ideas in concrete." Miller has already teamed up with a local furniture maker, Ethan Hutchinson, and two local jewelry designers, Jill Lueders and Wendy Mather, of Marta Designs. Hutchinson creates chairs and tables that artfully combine wood and concrete. Lueders and Mather create unique necklaces that incorporate colored concrete and Swarovski crystals. Their products are available through the Concrete Revolution [Studio] online store. The Concrete Revolution [Studio] product line is available through their website. You can have products shipped directly to your residence, or if you are in Colorado you can visit the showroom where they have an inventory supply.